The amaranths are an extremely large family of plants used for food and bloom. Aurora - Amaranthus tricolor - Annual - This variety has creamy yellow upper leaves and bright green lower ones. Full sun; plant height: 18-24in. 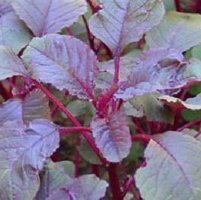 Early Splendor - Amaranth tricolor - Early blooming well branched plants with slightly pendulous scarlet blooms and burgundy foliage. Very attractive in a bed or border. Full sun; height: 42in. Elephant Head - Amaranthus gangeticus - Annual - reseeds freely - Dark red-purple blooms stand erect and remind one of an elephant's head with raised trunk. Rare German heirloom; drought tolerant: Full sun; plant height 3-5ft. 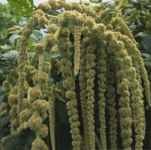 Green Tail - Amaranth caudatus - Annual - Yellow-green pendulous blooms and green leaves. Makes a great companion to Love Lies Bleeding below. Good cut or dried flower. Full sun; height: 42in. Green Torch - Amaranthus hypochondriacus - Annual; Companion to Torch, with green flower heads. Full sun; plant height: 24in. 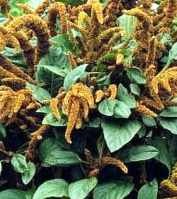 Hot Biscuits - Amaranth cruentus - Annual - Orange brown drooping spikes on sturdy uniform plants. Excellent cut flower variety. Full sun; height: 46in. 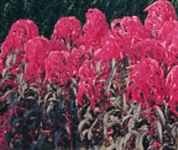 Love Lies Bleeding - Amaranthus caudatus - Annual - Long drooping plumes of deep red make an excellent backdrop or specimen plant. A favorite of Victorians. Full sun; plant height: 3-5ft. Perfecta - Amaranthus tricolor (Summer Poinsetta, Joseph's Coat) - Annual - Bright yellow and scarlet upper leaves and green lower ones with chocolate markings make this a colorful addition to your garden. Full sun; plant height: 18-24in. Torch - Amaranthus hypochondriacus - Annual; Tall spikes of red add a touch of color to the garden. Full sun; plant height: 24in. Calaloo (Vegetable Amaranth) - Amaranthus tricolor - The leaves of this extremely heat tolerant green are used in salads and in cooking and are commonly used in Asian, African and West Indies dishes. Distinctive taste. The deep green leaves with purple veins are ornamental as well as tasty. Golden Grain - Amaranthus hypochondriacus - Good grain variety ripens to a golden brown. Heavy yields. 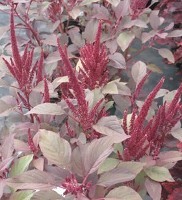 Lotus Purple - Amaranthus hypochondriacus - Grain amaranth Heavy yielding. Red/Purple heads with dark purple seeds. Leaves can be used for salad greens when young. Height: 8 feet.